So, I have this online questionnaire that I send to all of the soon-to-be-married couples that I'm shooting photos and videos for this summer. One of the points on there is about Receiving Lines. They can kind of be considered old fashioned sometimes and most people don't like them anymore (from what I've been told and my personal experience) - but sometimes they just happen; without you meaning to! Like it did at my wedding! At my wedding we had the ceremony and reception in the same venue: my Man in his tux, and I in my dress, had just walked down the grand staircase for our recessional, and were being hugged and congratulated by our bridesmaids, groomsmen, and parents. Before I knew what was happening people were lining up to shake my new husband's hand and give me a hug. It took foooorrrreever. And I felt so bad for the people that were at the very end of the line because they weren't enjoying the cocktail hour we had arranged for everyone (where we had planned on doing the mingling and thanking people for coming). Our mistake: sticking around, and starting an Inevitable Receiving Line. 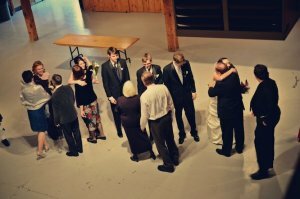 If you are not planning a receiving line right after your ceremony, make sure you exit the venue or hide in a place out of site immediately after the recessional is over or you will inevitably end up with a receiving line.